Pre-orders pages they are not, but Samsung has posted two “coming soon” pages for the Samsung Galaxy S 4 (SGH-M919) allowing you an opportunity do some time-wasting reading until the 1st of May. At the very least, you can get a look at the White Frost and the Black Mist color schemes and decide which one better suits you. There’s not a lot else to find or discover from these product pages, but if you’d like to learn every single thing about the Galaxy S 4 that you possibly can, this is the right place. On a separate but related note, there’s still no sign of any official T-Mobile pre-order, but I just got word that Walmart will allow a 10 day hold after release on either black or white with a $25 dollar deposit for Classic Plan customers in stores. I’m working to verify that information and get some images to support it, but it seems to fall in line with previous Walmart releases so I don’t doubt it’s a pre-order option if you absolutely must make sure you have a Galaxy S 4 waiting for you. Hit the page links below to ogle the Galaxy S 4 in black and white. I’m sticking with my Note 2…. Note II is almost an antique! Time to move on. Samsung is also updating S3 and Note 2’s with a lot of the GUI that will be offered in the S4, most of which I wouldn’t even switch on or use anyways, so agreed, why upgrade? Be able to fully control your friends TV secretly just to prank them is a good reason enough. Also, imagine the the money you will save for that expensive Logitech Harmony universal remote. That IR in that S4 should make life living easier. Knowing the temperature of your Room is good too. I can do that with the app tho…. I don’t need my phone to do all that….I don’t buy gadgets for the sake of performing certain functions that is not unique to that gadget. So if you want to buy a $600 phone to control your TV go for it. My $600 “universal remote” came with a HDTV. and you would know because??????? i’m waiting for the note 3 because i hear it will be more quality build or i’m going with the htc one. Note 3 will be 6″ i heard……isnt that too big for a phone? If it’s a full HD screen @6″, then maybe, just maybe I’ll add a line and just get it… But phones are getting ridiculously huge. As long as people keep buying them, then OEMs will keep making them bigger. I’ve loved HTC since the G1 but I need the removable battery. I’m in the Army and when I’m out in the field with no where to charge a phone its good to just pop in a new battery. I don’t have to carry the battery pack and leave it plugged in and wait till its charged. Yeah I might not have signal but I can still watch a movie when I’m doing nothing and with the micro SD ill have a lot of space. I just sold my Nexus 4 for this reason. I was on a convoy with no car lighter charger and my phone was dead. Luckily I had the battery pack but it sucked being on the phone with it plugged in.I see it as more convenient. HTC would of had my money if it had the removable battery. Don’t care much for the SD slot. I’m trading my S2 in for the S4. I just need something quicker and with more memory. 2gigs of Ram should be quick with 64gigs internal. I never bought into this quality build talk. I had the HTC AMAZE which had the best build ever.. Then the GS2 which was more plastic.. I would take the GS2 anyday. I was scared to even remotely drop that AMAZE. I prefer the lighter materials because they take in the bumps, they dont crack and break. I got my S2 the day it came out at TMobile and have been real happy with it. I just want something quicker with more internal memory. I’m really hoping this phone comes in the 32 gb internal storage model like my SGS3 did. I need the 32 gb version. Will be seriously pissed off if they only sell the 16 gb version. I know the 32 gb version in the SGS3 sold like hot cakes. Please T-Mobile don’t let us down, I’ve been waiting on this phone since the day I bought my SGS3. Don’t let us down. It is cheaper if you buy a 64GB micro sdxc card. You can’t put apps and large games on the sd card. I have the 64 class 10 sd card, I still want and hope the SGS4 comes with the 32 gb interior storage just like my SGS3. 16gb version comes with about 10 gb of usable storage, a couple of games and some apps and you just went through it all. High end phones need at least 32 gb of int storage with sd card. If no sd card 64 gb is the minimum IMO. Huh? I have a bunch of apps on my microSD card, some of them being large games. 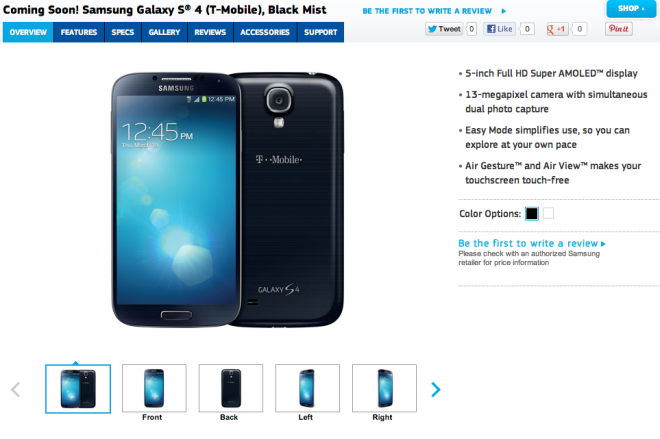 The S4 has 16 32 and 64 gig internal available.Im going for the 64gig myself. It goes up to 64gb internal which is what im getting. Just wish HTC will lay off giving exclusives…i know Att pushed for it for obvious reasons. There are many HTC fans on Tmo, Sprint etc who would’ve loved to procure the 64GB HTC One…myself included. 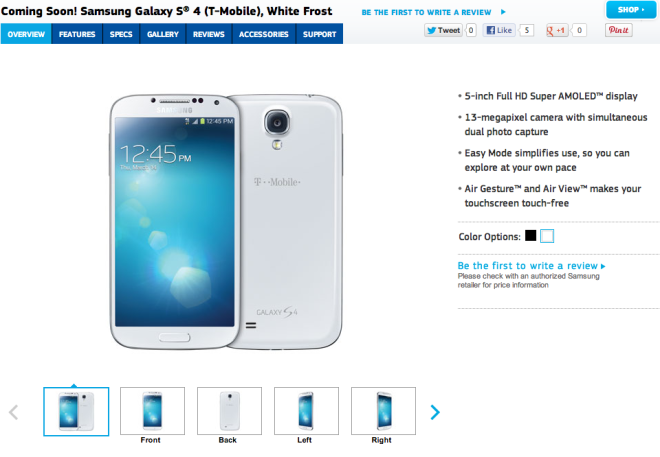 I would’ve loved to get the 64GB developer edition but it also comes with mostly Att bands with Tmo HSPA+42 absent. I know the Tmo refarmed 1900MHz band is present but not so sure abt Tmo LTE bands. T Mobile uses AWS band for LTE which HTC ONE Developer version supports. Truth is most ATT 4G LTE phones support AWS band AWS. I got 27down and 22up on T Mobile 4G LTE with unlocked HTC ONE X at San Jose downtown last Saturday. You get LTE but no DC-HSDPA on AWS bands with the developer edition, so that is just a bad idea, considering how limited T-Mobile’s LTE markets are at the moment compared to their regular 3G coverage. Luckily, 1900Hz HSPA has very good coverage around SF bay area and LTE is looking good. It took 3 month from T Mobile announce PCS HSPA at bay area until coverage everywhere. I am sure LTE would take similiar amount of time, I expect very good T Mobile LTE coverage at SF bay area by July. By the way, even without DC-HSPA, HTC ONE X can get as high as 12 down and 4 up with PCS HSPA. It’s not too bad at all. enjoy your pixelated pictures. 4 megapixel camera with “ultrapixels” does not make up for mediocre pictures. I know I’m not supposed to feed the trolls, but, your statement is false. It has a 4 megapixel camera compared to the Galaxy S4’s 13 megapixel camera. The only advantage the HTC One has in the camera area is that the ultrapixels are great in low-light situations. It takes in more light than other cameras, but the quality of every picture will be less than that of the Galaxy S4. Try to do some research before you post idiotic statements like that next time. Megapixels is a gimmick that companies use to hook people who don’t actually know anything about digital photography. I’d prefer 8mp or so (the approximate resolution of 35mm film) but given the same size sensor, larger photosites will give you a better image every time. While I would normally agree with the fact that the megapixel nonsense is indeed a gimmick, after having used a Nokia 808 I had to change my opinion. That phone is a very rare exception though. Really? Maybe you should do your research on that lol. When you take those pictures outside, your going to hate how it looks when it take it off your phone. Sorry man but you are completely wrong. Is it me or do images just keep getting more blue for this so called black model? Can’t deal with the plastic body!!!! But loving all the new phones coming to Tmobile this year! I am really wondering if your current phone right now has a protective case. T-Mobile offer a phone with down payment of $99.99 and $20.00 for 20 months. I am not sure where the discount of the phone is hidden. Nowadays, almost all phones sale with the down payment and financial option as money payment for 20 months, which drive me away from upgrade and signing the contract expansion with them. the samsung rep came into our store the day of the iphone 5 launch and to tell you the truth I wasn’t impressed at all..
too bad one cannot buy it unlocked on Samsung website. Apple and HTC let you buy their unlocked phones. I was hoping for a silver version like they have for the 3, but I’m sure that would come out later. Think I might go white. im waiting to see what the next nexus brings. heck its only a month away. Nexus needs to bring a 32GB at least unless they introduce a SD slot. Nexus 4 could have rocked Samsung world but it lacks 32gb. It looks like the model number system changed. M919? It sounds like METROPCS to me. BTW, T-Mobile version covers more HSPA and LTE bands.